NEW YORK — Michael Conforto is two months past his 23rd birthday and hasn’t even been a professional for two full years, but he already is threatening to join the short list of big-name sluggers who make life miserable for Giants pitchers. Conforto, a second-year outfielder, was in the middle of everything the Mets did Saturday, getting three hits off Matt Cain and driving in three early runs to hand the Giants a 6-5 loss at Citi Field. Cain was in trouble early, loading the bases in the first ahead of Neil Walker, who is off to a hot start. Walker poked one to shallow right and Kelby Tomlinson’s dive came up about a foot short, allowing two runs to score. The Mets got two more in the second on Conforto’s double. Jacob deGrom had allowed just two total runs in his first two starts of the season, but the Giants got some help while putting a three-spot up in the third. A two-out throwing error by third baseman Wilmer Flores put two on, and deGrom walked two, getting the Giants on the board. Hunter Pence’s two-run single to right cut the deficit to one, but the Giants wouldn’t score another run off deGrom, who departed after six innings with a 1.02 ERA. The lead grew when Conforto hit a solo shot to right in the fifth. Flores added another solo homer an inning later. Matt Duffy drew a 12-pitch walk to kick off an eighth-inning rally and the Giants loaded the bases with no outs. Hunter Pence crushed one 381 feet and Brandon Crawford smoked a 372-foot liner to right, but both balls were caught. The two sacrifice flies got the Giants within one, but that was all. 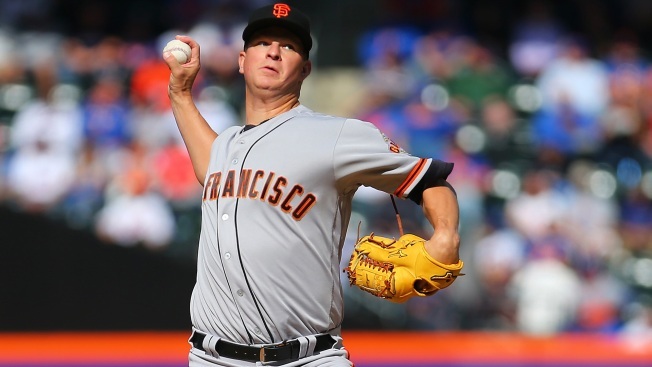 Starting pitching report: Cain threw a season-high 108 pitches in his six innings, giving up seven hits, walking one, and striking out five. He has been charged with 21 earned runs and 34 hits in 27 innings this season. Bullpen report: Josh Osich pitched a scoreless seventh that included a groundout from Conforto, a fellow Oregon State Beaver. At the plate: Brandon Belt walked in his first two plate appearances and again in his fourth, giving him 10 in a span of 26 trips to the plate. Belt finished the game tied for third in the National League with 18 walks. In the field: The Giants nearly got out of the eighth when Bruce Bochy challenged Neil Walker's slide at second. Walker slid past the bag, but it appeared he could have kept his hand on second the entire time if he had not tried to push himself up as he started the journey off the field. The Giants lost the challenge, but the fact that it took so long to look at an everyday fielder’s choice is another sign that this rule needs to be altered. Attendance: The Mets announced a crowd of 44,436 human beings. It was the largest regular season crowd in Citi Field history, which seems odd given that they play the Yankees occasionally. Up next: Rain, lots of it. The forecast calls for rain from Sunday morning through Monday, which could scuttle one of the best pitching matchups of the season. It’s supposed to be Madison Bumgarner vs. Noah Syndergaard.